I start with some basic things and the explanation of terms but I do not go too deep into details. There would be too much information at the beginning. For those who are interested in all details I recommend a view into the respective literature later. As for each topic there is a special terminology for sailing as well. The sailing jargon consists mainly of fragments of English, Dutch and German and has evolved over centuries of maritime history. What we now need for sailing is a sailboat. And everything on a boat has a special name. I will try to limit myself to the essentials. Also, check out the images provided. I will now mention a lot new terms to you. You do not have to memorise all of them immediately. You will learn them over time. This will be easier for you later, because you will have already heard about the technical terms during this course. At the end of the my book and ebook, the terms are listed in alphabetical order in the glossary and are briefly explained there. So you can look up there any term, should you have forgotten its meaning. At the end of every chapter of the beginners’ sailing course in my book and ebook, there is a small multiple-choice test where you can check up on what you have just learned and also come back later to check your progress. The boat has a hull. It has four sides. At the front you have the bow and the rear-side is the called stern. Seen from the rear the left side is the port side and the right side is starboard. In the hull there is the cockpit where we usually sit. On top of the hull stands the mast. It is stuck through the deck or stands on it. The mast is held up by the shrouds (sidestays), which are fixed on the port and starboard side of the hull. From there they go to the top of the mast. To the front the mast is held up by the forestay. Bigger boats and yachts have a backstay that holds the mast to the back. On smaller boats this function is done by the shrouds as well. Towards the bottom of the mast the boom hangs. Mast and boom are connected through the gooseneck. At the end of the boom, the boom head, the topping lift is attached. It is a line that goes from the end of the boom to the top of the mast (masthead). It prevents the boom from coming down, when the sails are lowered. At the stern the rudder is fixed. The rudder is operated by the tiller. If the tiller points to port side the boat steers to starboard. If it points to starboard the boat steers to port side. If it points towards the mast the boat will usually go in a straigt line forwards. Figure 3: If the tiller points to the mast the boat runs (usually) straight forwards. Figure 4: If the tiller points to port side the boat will steer towards starboard. Figure 5: If the tiller points to starboard the boat will steer towards port side. Below the hull there is the centreboard. It can be raised and reduces the drift of the boat. Bigger boats often have a keel instead. It is firmly fixed and has so much weight that the boat cannot capsize easily. The parts of the boats that are under water and that you see from the side are called the lateral plane. It includes the centreboard, the underwater parts of the hull and the underwater parts of the rudder. The lateral plane makes up the underwater counterpart pressure to the wind pressure that arise when the wind fills the sails. I will tell you more about this subject later. Now, let’s talk about the sails. There is a mainsail and a jib sail. The mainsail has to be pulled up the mast nearly all the way to the masthead. To make sure the wind does not blow it sideways, the rear bottom corner of the mainsail has to be fixed near the boom head. If you do not have a loose footed mainsail, you have to slide the bottom of the sail into a track or a groove on the top of the boom. 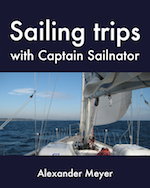 This online sailing course has also been published as ebook and paperback. For more information click here! A sail has three edges. The bottom edge of the sail is called foot, the front edge is called luff and the back edge is called leech. 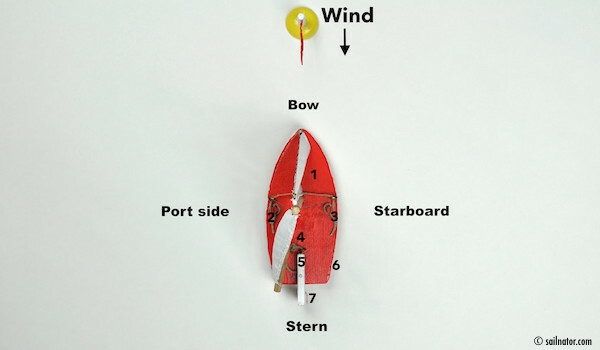 The corner at the top of the sail is the head, the back bottom corner is the clew and the front bottom corner is the tack. At the head of the mainsail the main halyard is attached, a rope or wire which runs to the masthead and through the mast back to the cockpit where you can pull it to hoist the sail. Main halyard and jib halyard are ropes to hoist ore secure the sails. On the other hand mainsheet and jib sheet are ropes to release and trim the sails. Sheets and halyards belong to the running rig. Shrouds, forestay, backstay if you have one, and mast are the standing rig. The mainsheet is attached to the boom. It runs through a pulley, called the block, to the bottom of the cockpit. There the helmsman operates the sheet with the hand pointing towards the bow, the other hand being used for the tiller.. 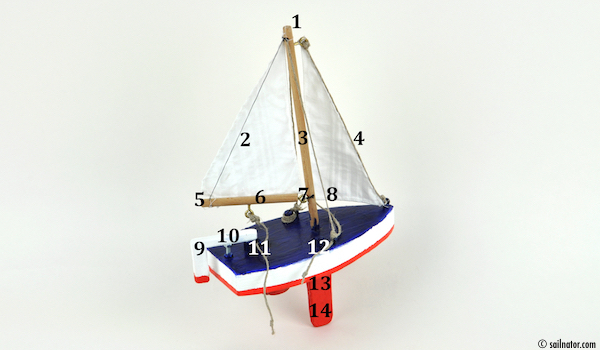 Depending on how the boat is in relation to the wind direction the sails have to be trimmed. You do this with the sheets. The mainsheet is accelerator pedal as well as the brake of the boat. When you ease the mainsheet so that the sail is fully luffing, the wind passes the sail without any effect. If hauled at the right angle (respective to the wind direction) the boat will start to sail. Never wrap the mainsheet around your hand. When the wind blows suddenly too strong you have to be able to ease it very quickly to avoid capsizing. 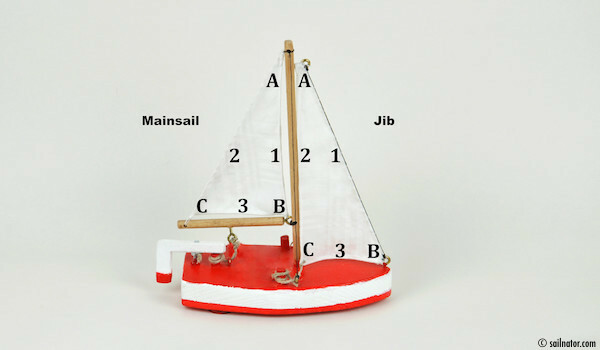 The luff of the jib sail is attached with clips or snaps to the forestay. In some dinghies a wire runs through the luff that replaces the forestay when the jib is hoisted. The jib has to be hoisted with a halyard too, which is attached to the head of the jib. Edges and corners of the jib are correspondent to the mainsail. The sheets are attached to the clew of the jib. Do you remember what sheets are for … ? Sheets are ropes to release and trim the sails. With the sheets the jib can be pulled from on side of the boat to the other side. The wind always pushes the sails to leeward side, which is the side where the wind blows to. The wind comes from the windward side. The helmsman always sits windward, facing the mainsail. He has a better view looking forward from this position. Often, he also needs his weight on this side as ballast. The boat leans or heels to the leeward side because of the wind’s pressure in the sails. In a dinghy the crew sits in the middle of the boat as long as it is not heeling. In stronger winds the crew sits on the windward side next to the helmsman. In calm winds the crew moves leewards so that the boom has a leeward tendency and the breeze does not have to push the weight of the boom all by itself anymore. Please note: The boat always has to heel a little bit to the leeward side and the crew has to trim the boat by moving their weight accordingly. Figure 7: The helmsman always sits on the windward side. When the boat is not heeling at normal winds, the crew sits in the middle of the boat. 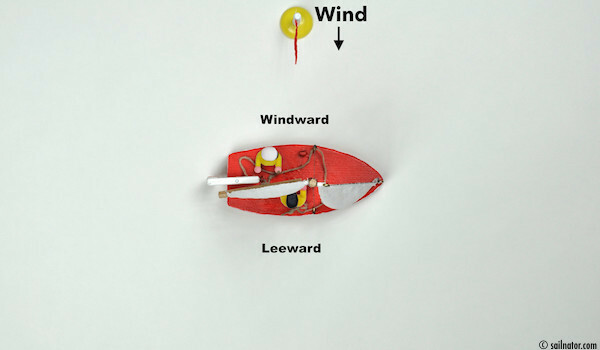 Figure 8: When the boat heels to the leeward side in high wind, the crew sits on the windward side, too. Figure 9: When the boat is liable to heel to the windward side in calm winds the crew sits on the leeward side. The most important technical terms have now been introduced. In the next chapter I explain why a sailboat runs forward. © 2013 -2019 sailnator.com | All rights reserved. 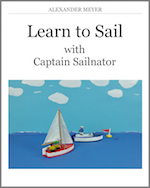 Support sailnator.com by buying a book or ebook, so we can keep on offering the online sailing course for free!! Thank you very much!!! My online sailing course has also been published as ebook and paperback. For more information click here! My sailing trips have been published as ebook and paperback. For more information click here! 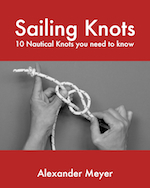 The knot-lessons have also been published as ebook and paperback. For more information click here!